Adnan “Blackbeard” Zaman came into Paris Games Week as the 51st player on the Tekken 7 leaderboards in Europe. But a massive run through the Tekken World Tour event this weekend took him all the way up to the top, placing him in the top three of his region just ahead of the world tour finals. Zaman plays Josie, an energetic fighter that mirrored Zaman’s own disposition. During his tournament run, Zaman would have a visible reaction with every win, sometimes small, and sometimes a little more obvious, like his shrug to the audience after a perfect round. Making it to the grand finals, Zaman’s final opponent was Shimon “Tissuemon” Kawai, the second-place-holder on the leaderboards at the time. His Master Raven was formidable, and even managed to reset the bracket (defeat in one best-of-five set, chalking up one of the two eliminations needed) on Zaman. Matches would come down to slow-motion cams, a signature of Tekken that just exponentially hypes up those final moments. 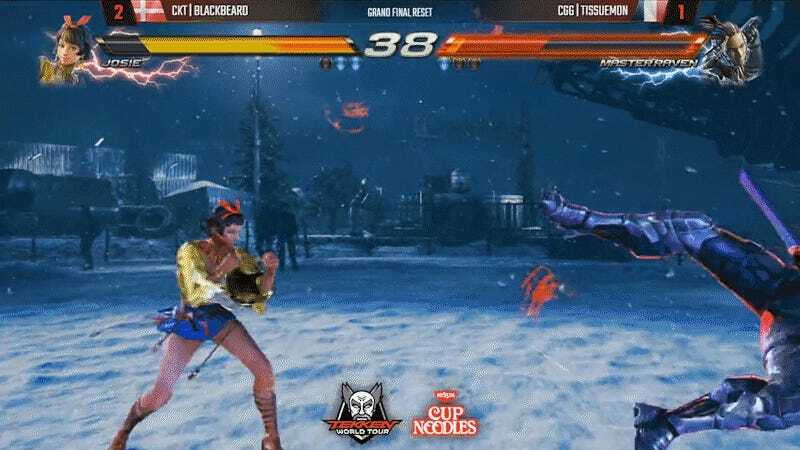 Despite the reset, Zaman bounced back and took the fight to Kawai, ending the second set 3-1 and leaping from 51st place up into one of the top spots for his region, earning him a spot at the Tekken World Tour Finals. Though the World Tour site hasn’t updated with the Paris Games Week results at the time of writing, one reddit user took it upon themselves to do the math and found that with the tournament results, Kawai would be the new top dog in Europe, while Zaman followed at second. You can catch the whole grand finals set in the Tekken Twitch archives here.